In the depths of February I find myself once again back in Salisbury, at the wondrous Sarum Studio, studying the Old Masters techniques with Nicholas Beer. I have commenced my painting training, and have 5 weeks of full-time brain-melting studying of portraiture and the human figure. It is unbelievably challenging and my mind is full of exciting new information. On day 2, the portrait is transforming better than expected, the figure painting less so, it should be a 10 day project but I only have 3 days, so all a bit frantic, still it is a great place to start the learning curve. The painting technique differs hugely from my own in many ways, the main one is regarding brushes – For the past 10 years I have worked mostly with soft flat acrylic brushes, or very tiny ones. I am learning to use hog bristle brushes which are flat but rounded at the end, so there goes my ability to create straight crisp edges! Small sable ones are used for detail and highlights. I never throw away brushes, which means that I own hundreds and hundreds of them, most have been at some point left unloved and abandoned after a painting session with the best intentions of returning later to continue painting or clean them. I searched through my battered collection and dug out large quantities of old and abused hog brushes, most of which were rock solid with old paint and varnish. I then remembered my 5 litre tub of non-toxic water based paint stripper which I have used for my house renovation. With a little patience and squidging, I brought them all back to life. Nick wasn’t quite as impressed, my paint collection and palette instil horror in most who set eyes upon them, yesterdays comment was ‘are you really planning to use that palette?’ It was caked in an unsightly rainbow of multiple layers of paint – I hastily turned it upside down and used the clean side. There is a way of wrapping wet brushes with tissue paper to get all the bristles tidy and in good shape, unfortunately time ran out and I just let them dry, and many had wayward bristles sticking out in various directions. I just about found some usable ones in the pile. The technique involves a limited palette of just a few colours, which were the only ones which were available way back in the past, not having a blue is strange, instead, ivory black is used (not the most obvious name for a black) a lead white and only 3 other colours. You would think that mixing flesh tones with what would seem like only a few options would be easy but noooooo, it is not. Another major difference are the painting mediums and thinners , my Zest-it ones have been banished, and I now spend my days slightly high on turpentine and some other traditional substances, which I must say, are fabulous to paint with. I am very happy there! 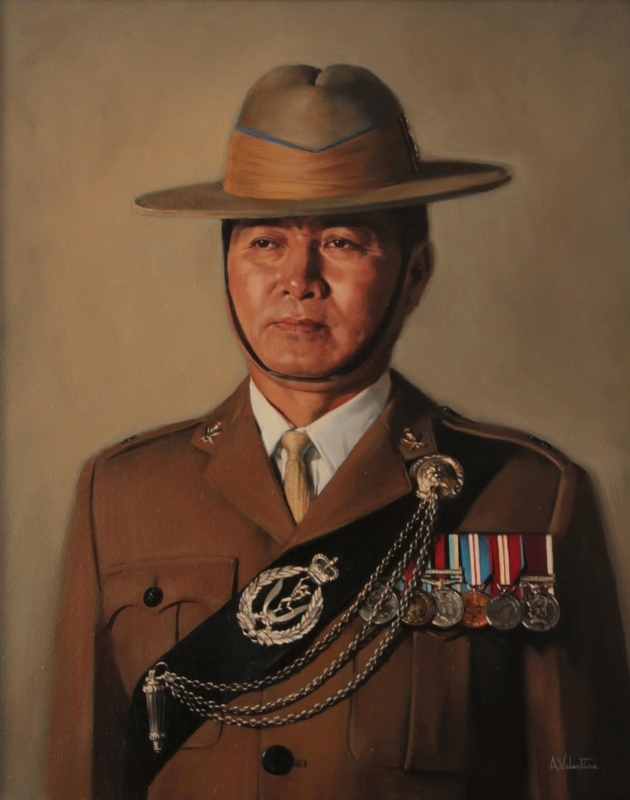 Here is the latest official Queen’s Gurkha Signals portrait.